Just have to share this stunning plant! It is illuminating our whole tropical garden, especially during this time of the year, the wonderful Season of Advent and Christmas! It is none other than the beautiful Mussaenda erythrophylla ‘Ashanti Blood’ which displays vividly the vibrant colors of Christmas – red and green! 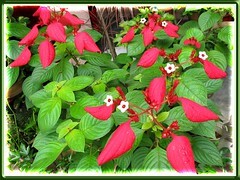 It is therefore not surprising that some regions in the world have planted Mussaenda erythrophylla as Christmas Plants, replacing the traditional Poinsettias (Euphorbia pulcherrima) which is as striking with showy scarlet bracts above its green foliage. The latter, however, only blooms during certain seasons whilst the former shines all through the year, thus the preference I suppose! How bright and vivid these blood red sepals are! No wonder this beauty is aptly known by its common name ‘Red Flag Bush’, as their striking red flags sway with the wind. 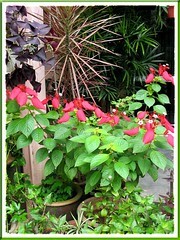 Actually, this potted plant was added to our garden in early November, and it has not stop showing off its beauty that became more apparent as it threw out new branches and adorn itself in lovely fresh green and stunning red attire. Truly a traffic stopper! Even its inconspicuous off-white starry flowers are attention grabbers and often visited by butterflies! 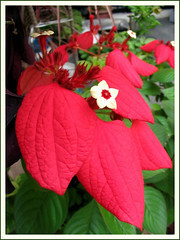 Such an attractive and stunning Christmas plant to have in our tiny garden plot this Season! 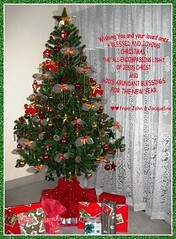 It seemed as if both the prettily decorated Christmas tree inside our home and this gorgeous Christmas plant in our garden outside, are seeking our attention!